In many cases, a harp owner might wish to amplify their harp, so it can be heard better in larger venues or better balanced when you perform with other instruments. 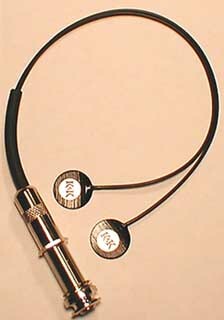 I am now offering the K & K Sound System which includes The Big Twin transducer pickup and the Pure Preamp. The Big Twin Internal System requires that a hole be drilled in the harp's soundbox for installation. I can install the K & K Big Twin pickup for you at the time of construction, and the price below includes installation. Please note that this pickup is only availble from me at the time that the harp is purchased. You must contact the K & K Sound company directly if you wish to purchase the unit separately from the purchase of the harp. This pickup has been especially developed for harps and delivers a full, rich quality of sound. It's simple and noiseless circuit provides unsurpassed clarity and power. The two pickup heads attach to the inside of the soundboard with a special double-sided tape. 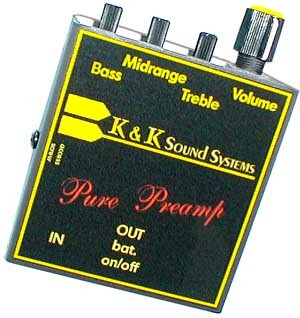 The Pure Preamp is an external preamp with a belt clip and is powered by a 9v battery, which should last about 180 hrs. It has a volume (gain) control and separate tone controls for the bass, midrange and treble so that you may fine-tune the tonal balance of the harp over the entire string band. Not included in the system that I provide is the patch cable that connects the Big Twin Pickup to the Pure Preamp nor the cable that connects the Preamp to the PA/amplifier system. These are available at music stores and online. Always use shielded instrument cables. An "L" jack on one end of the patch cable that connects the harp pickup to the preamp is desirable. Price includes the installation of the pickup. If you travel a lot, it is wise to keep an extra set or two of strings on hand, as you never know when one or two strings are going to break, and re-order time can be anywhere from two to eight weeks. You can ask for 'express' service at additional cost. Don't get caught out on the road string-less! The spare set includes a full set of strings, both bass wires and 'carbons'. 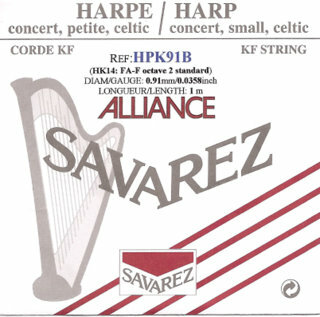 Should you require additional strings after purchasing your harp, it's best to order them directly from the suppliers, which are listed on the 'Strings' page as well as in your Owner's Manual and accompanying string chart. 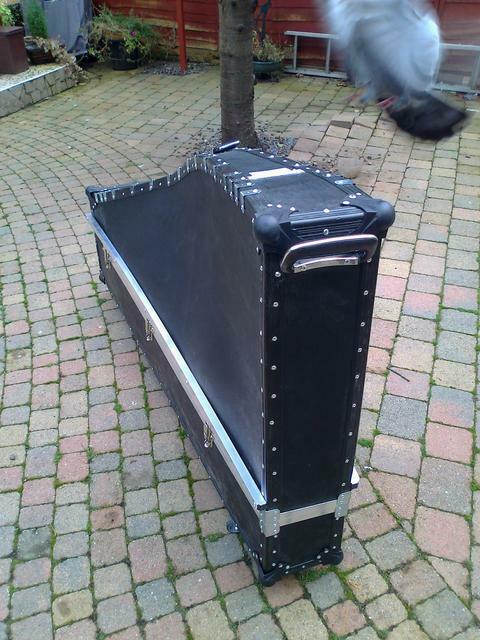 Located in Dublin, Ireland, Ray Doherty makes some of the best flight cases I've seen. His new lightweight case makes use of lighter-weight construction material, while still retaining the heavy duty latches, handles and wheels. Included with the harp package deal is the deluxe Cronkhite soft case made under license by Torpedo Bags of Minneapolis, Minnesota. The outer fabric is cordura, and the inner-padding is 1/2” heavy closed cell foam. The case has a large pocket, padded shoulder strap, leather hand straps, and zipper closures throughout. It also comes with a small zippered pouch into which you can put small things like tuning keys and electronic tuners. The standard colour is professional black. 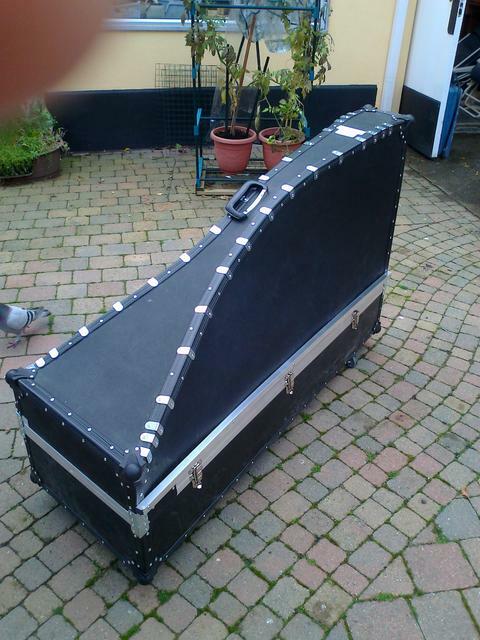 This is the best case that money can buy, and the best in soft case protection for your instrument. These legs are designed to be easily removed from the harp thus decreasing the size of the harp when transporting it. The standard length of the legs is 6", which will raise the harp up 4" more than the standard height. The detachable leg system includes a matching wooden base plate attached to the bottom of the harp and zip pouches for storage. This is my favourite tuning key. The soft rubber coating minimizes the damage to the harp the key is dropped on the soundboard while tuning. The ergonomic design makes it very comfortable to use.